Look at most of the walls in your home and the vast majority will be of the stud variety. While bricks and mortar are required for the loadbearing elements of your property, when it comes to simply separating sections of your house the timber and plasterboard solution is much easier and naturally, cheaper as well. The problem with stud walls is that they aren’t quite as significant as their bulkier alternatives. In other words, they can puncture much more easily and at times, holes can appear. 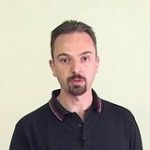 Of course, a reasonable amount of force is needed for this to happen, but it’s unfortunately quite common and the source for a lot of headaches for homeowners. Bearing the above in mind, we’re going to take a look at the various methods you can use to fix holes in stud walls. 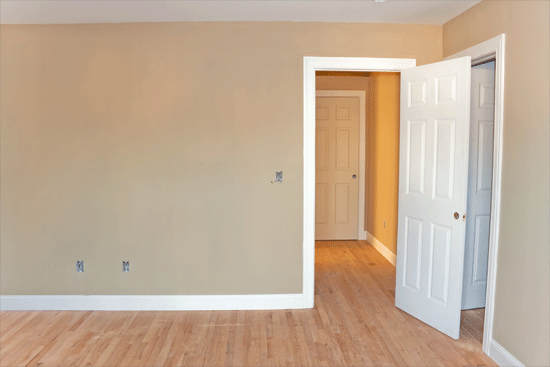 Whether you have a small hole in your wall or a large one, read on to find the best solution. While the list of reasons why you have incurred a hole in your stud wall is likely to be exhaustive, if it’s quite small in size it’s most probably because some form of object has inadvertently collided with it. If your hole is less than the circumference of a fist, it can probably be classed as small for the purposes of this guide. Here is what you have to do to fix the problem. For this first step you will need to arm yourself with a pencil and spirit level. The idea is to locate the hole and then draw a rectangle around it. Naturally, with the end goal being to keep your fix as neat as possible, you will need to rely on the spirit level to help you achieve this. Now that your rectangle is drawn, it’s time to inspect the area. One of the downsides of these stud walls is that all sorts of cables and pipes can be hiding behind them and naturally, if you cut through one of them a major problem can occur. As such, it’s at this stage that you need to check that no such wires are around, with a stud finder generally being able to detect this for you. In the case of pipes, you should be able to tell if you are about to cut into one, and can therefore pause your work. It’s at this point that the coast should be clear in terms of wires and pipes and you can get to work. 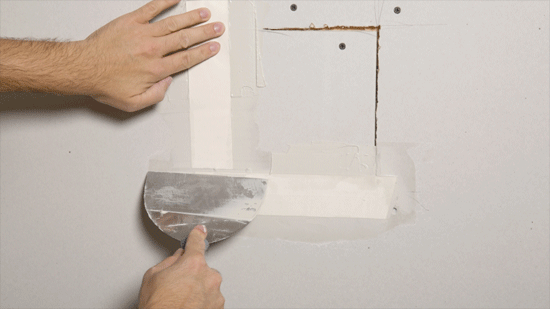 Take a drywall saw and a retractable knife before neatly cutting around the rectangle you have drawn. Next, you need to place a batten behind your hole so you can create fixing points. Put the batten through the hole, hold it in place, before drilling through the plasterboard to attach. You will now need to cut a piece of plasterboard which matches the same size as your rectangle. Then, attach it to your new batten with some drywall screws. To complete your project, apply filler to the holes – making sure you cover the screw heads which will now be prevalent because of your newly inserted batten. Of course, the approach above isn’t going to be sufficient if your hole is somewhat on the large size. The main problem here is even if you attach a batten on the other side of the plasterboard, it’s unlikely to be significant enough to hold a new piece of plasterboard. As you’ll now see, there are quite a lot of similarities between this method and the previous one discussed. The only time where things start to change is when you are attaching the frame behind your stud wall. Let’s take a look at this in more detail. As you are dealing with a much larger area, there is also a higher chance that you are going to come into contact with cables and pipes as you perform your work. For this reason, the first step we recommend is checking the area for such component and again, you’ll need to arm yourself with a stud detector to help you along your way here. Now that any pipes or cables have been detected, it’s time to find the studs. Again, your stud detector will come to your aid here, and you need to measure the distance between each of them. Draw vertical and horizontal lines across each respective stud – with the end result being a rectangle which highlights where each stud around the hole is. For the best results, make sure you carry out this task with a spirit level. The third step is to start cutting away the rectangle which you have drawn. Just like for smaller holes, you will use a drywall saw and retractable knife for this. Make sure all of the damaged plasterboard is removed as you proceed with this. This next step is arguably the most difficult to achieve. You’ll need to attach noggins (also known as horizontal wood supports), to each of the studs. This needs to be done both above and below the hole, as it will provide you with adequate fixing points as you attach the new plasterboard later on. Now that your hole and the noggins are prepared, you will need to cut an appropriate piece of plasterboard to fit in the hole. This process is exactly the same as what we explained for the smaller hole and the main aim is to be as accurate as possible with the sizing. With your new plasterboard, you need to fix it to the wall with your drywall screws. It’s also advisable to fix the original plasterboard (outside of the rectangle) to the noggins for additional security. Finally, it’s all about making the area neat. You need to tape along all of the edges, before finishing the surface with your plaster. It’s at this point that you will leave to dry and sand as you would if you were plastering a new wall.